Spring rolls are one of children’s favourite snacks, a simple-to-make and delicious-to-eat starter, and a common serve during Ramadan. 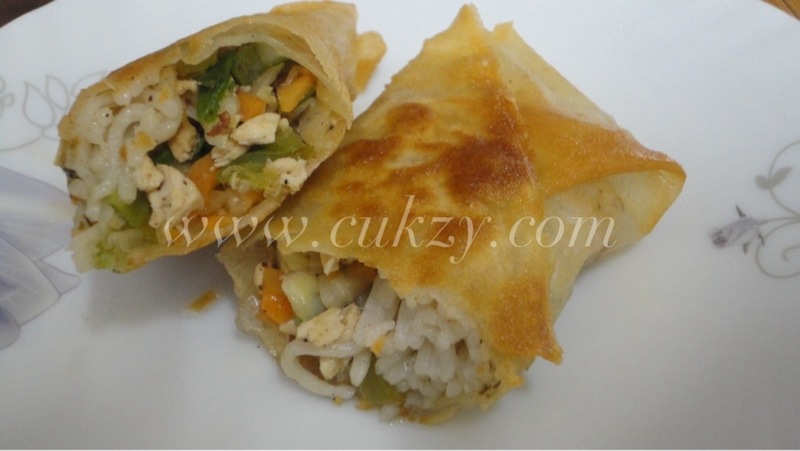 I’ve written the method for preparing the spring roll wrappers as well. You can try adding different ingredients to the stuffing and exploring new flavours, because there are very few chances for a disaster. In this spring roll recipe, I have added rice noodles and capsicums – a version I had a Chinese restaurant. Some spring roll recipes use vermicelli as well. I am yet to try that. If that’s a success in my house, I’d surely share it with you. 1. Blanch the vegetables to soften them a little, especially the cabbage. 2. Heat oil in a wok. Roughly chop the onion bulbs from the spring onion and add to the wok. Add in the minced garlic and sauté for a few seconds. Avoid burning them. 3. Add the vegetables one by one starting from the cabbage, then capsicum, and lastly the carrots. Season with black pepper and salt and sauté for about a minute. Add in the spring onion greens. 4. Add in the chicken, vinegar and the soy sauce and stir. You can add in teaspoon of chilli sauce if you like your spring rolls to be a little spicy. Mix well and sauté till the vegetables are done. 5. Turn off the gas and add in the rice noodles. Stir gently to avoid mashing the noodles. I generally toss the ingredients to mix them instead of using any sort of spoon. 1. Sift the flour into a mixing bowl and add salt. Add water little by little using as much is necessary to make a thin batter. Cover and let rest about 30 minutes. 3. Cook until the wrapper is dry and shrinks from the the sides of the pan. Use up all the batter to make spring roll wrappers. 4. Make a dough-paste using maida and water. 5. Place 1/2 tablespoon of stuffing at the centre of one end of the wrapper. Roll it inwards and then fold both sides into the fold. This way you’ve locked in the stuffing from the sides. Roll it again and seal the spring roll with the dough-paste. 6. Deep fry the spring rolls. Make sure you fry is relatively hot oil so that the rolls don’t absorb too much oil. Fry till the rolls have become golden brown. Drain on kitchen towels and serve.